Walk-in tile showers offer ease of use compared to a tub-and-shower combination, which requires clambering in and out of a tub and the complications of negotiating shower curtains or a sliding glass or plastic door. Instead, a walk-in shower has a shower area and an adjoining entrance area large enough to confine the water to the shower, eliminating the need for doors or curtains -- though sometimes glass doors are included as a design element. Tile walk-in showers add a modern, attractive, natural look to a bathroom. Large tiles in natural tones give a spa-like look to a home shower. Incorporating bathing features such as multiple body sprayers and steamers transforms any walk-in tile shower into a spa-like retreat. Both elements work well in a tiled shower because tile is resistant to steam and water. Adding a bench and enclosing the space with solid walls instead of glass enhances the spa theme; benches provide a place to relax while enjoying multiple sprayers or steam, and an enclosed bathing area offers added privacy. Insert a removable bench or have one built in. When enclosing the walk-in shower, use light-colored tiles on the inside to make the space appear large. The sight of nature evokes a sense of tranquility, and bringing outdoor-like elements into walk-in showers have the same effect. 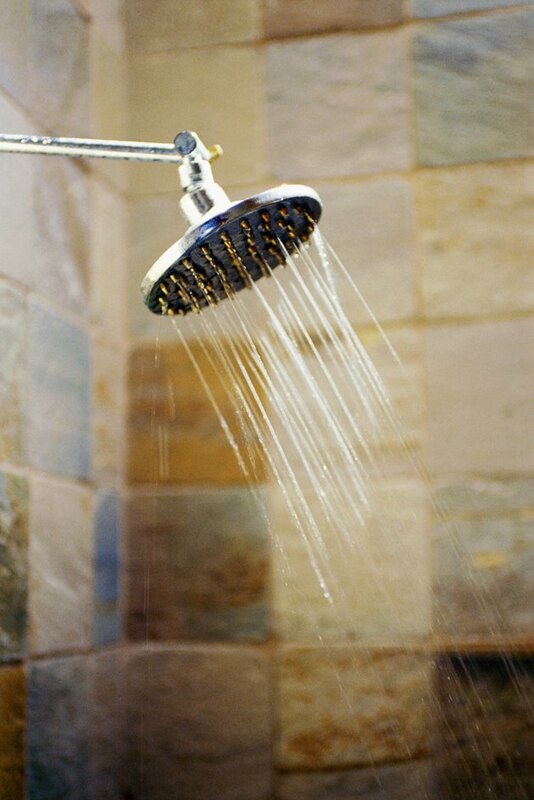 Installing a rainfall shower head in the ceiling gives the feeling of showering in the rain. Incorporating a river-stone floor further brings the outdoors into the shower; since the stones provide an uneven surface, they give the feeling of standing outdoors, but the smooth stones massage your feet while showering. Provide a view of the outdoors by incorporating a large window overlooking a natural setting, but take into account privacy factors. Dual-entry showers involve a large showering space with multiple shower heads, allowing more than one person to shower at a time. This design scheme opens up the tiled walls, eliminating any feeling of showering in a cramped space.A dual-entry shower is enclosed by a wall with an entry space on both sides of the shower area. The wall setting off the shower can be installed to the ceiling or as high as desired; a wall high enough to allow some modesty but low enough to allow the bather a view of the rest of the room opens up the space and gives a more airy feel. Sarah Tidwell is a freelance writer based in Florida. She contributes to several online publications and works as an online college instructor. Tidwell completed a master's degree in adult education and training/e-learning.